I'm ready for my closeup Mr. Demille!!!!!!!!!!! Oh, today I am so very funny! If I posted a close up I would get banished for life from blog land! Imagine the horror of not being able to show off your bright and colorful spring outfits, the void in your life due to no beautiful comments! Oh, the horror!! So, instead I will just show another picture of me standing by the french doors and wearing my BRIGHTS!!!!!!!!!!!! This is probably about as bright as I get. For the most part I like subdued color. I don't think I would look well dressed as a highlighter. But, to each his own that's the great thing about having your own blog. You own it. Except tonight I had to pay Google $5.00 to increase my Picasa storage. It happened to us at work today too so I have a feeling lot's of changes will be coming to Google applications. Tonight I will be linking up to With Dawn at Thursdays Are For Thrifters. This is truly one of my favorite link ups. I will also be linking to that AWESOME link up at Silver Style. Trending Through the Decades: Brights. (I'm sure you realize that is my link up but, I always wanted to hear somebody say that and after all it is my blog). It's simple and painless. You don't have to follow me just make friends with the little blue guy and you're in. It makes it more fun if you can remember to put your age decade next to your name and of course the blog police will be at your door if you don't link back to my site. I think I heard that is called blog abuse! So click over and get ready for Brights, Camera, Action. You never know Mr Demille might just be looking! Dang work. Just wears me out! Pashima: Gifted from Two Birds with my poncho purchase. fabulous colors, very candelicious colors, and they look so good together. I like how you layered the pieces as well. I will link up real soon! 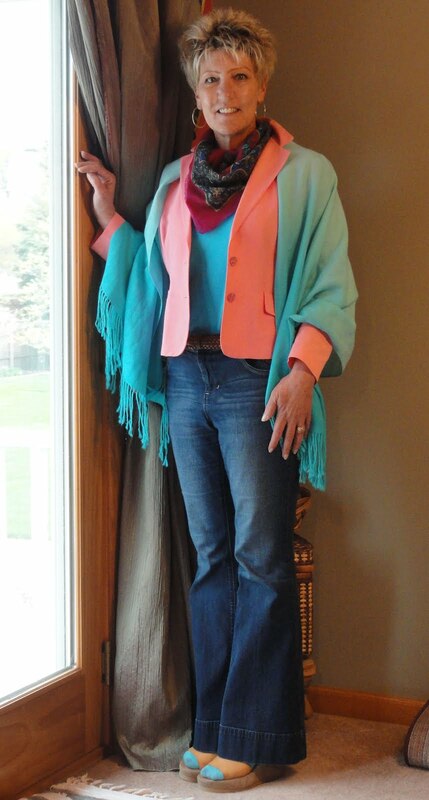 The pink jacket is just so delicious with the blue shawl. Wonderful colors. You look fabulous! I love your $2.50 blazer! $2.50??? I think you should wear more colors, it really looks goo on you! The scarf and the socks...NICE! Oops, I meant GOOD not goo. Lovely colors ... you look gorgeous. Oh Tammy this post made me laugh. I love the part about dressing as a highlighter. You put my thrifting to shame, I've never gotten away with spending less than $7.99 on a blazer; maybe I'm in the wrong thrift stores or maybe Ottawa's just more expensive? Anyways, yours is a gorgeous colour (I'd venture milky peach?) and looks great with your ombre pashmina. I just so happened to wear a bright outfit yesterday so I will link up shortly! You bring home the best and most inexpensive thrift finds! I love love love that blazer. I am very into that color this spring and what a bargain. Do you have one particular store you go to or do you go to many to find such good bargains? I love that you have on your bright socks. Looking beautiful as always! Thanks for linking up with Thursdays are for Thrifters! pretty colors! love the jacket and the shawl together. you look great! and the blazer is awesome! You look so good in sandals and socks!